T he rest of the club is gunning for Team Anderson as they make a strong start to the 2015 season by winning the first two events! 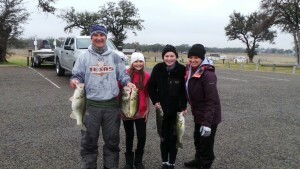 They claimed top honors on Stillhouse Hollow with a limit weighing 16.92lbs. Great job! Next month the club travels out of town to Lake Sam Rayburn for their spring two day. Let’s see if team Anderson can make it three in a row! Use your Facebook account to leave us a comment! Note: Facebook comments posted here are visible to everyone.